Hunting associations and wildlife authorities should be aware that H5N8 and other avian influenza viruses might be present in waterfowl hunted during the migratory season. No human cases of the avian influenza H5N8 subtype currently circulating, or other viruses of this subtype, have been reported. However hunters are potentially at risk of infection from influenza viruses and other avian pathogens (e.g. salmonella, chlamydia). There is no evidence that properly cooked waterfowl (or domestic poultry) can cause illness in people. Hunting, handling and dressing of shot waterfowl carries the risk of spreading avian influenza viruses to susceptible poultry. Surveillance of wild waterfowl is an important function that hunters can perform to assist the Department of Agriculture in avian influenza controls. 1. Wear rubber gloves while cleaning game or cleaning bird feeders. 2. Do not eat, drink or smoke while cleaning game. 3. Always wash hands with soap and water (or alcohol wipes) immediately after handling birds or other animals, when cooking or preparing animal products, and before eating. 4. Wash tools and work surfaces used to clean game birds with soap and water, then disinfect with a 10 percent solution of chlorine bleach. 5. Eat only fully cooked meat (70OC at the core). 6. Avoid introduction of avian influenza viruses to poultry through fomites (clothing, boots, vehicles, etc.). 7. Do not feed wild bird scraps to poultry or domestic animals (cats, dogs). 8. Any waste from hunted birds should be treated as potentially contaminated and safely disposed of. 9. Seek immediate advice from your doctor if you show signs of fever within 10 days of having contact with poultry, farmed birds, wild birds or other animals. 10. 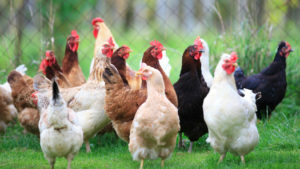 If it is suspected that you have been exposed to avian influenza, your local Public Health Department will also be in contact to carry out a risk assessment and you may be advised to take an anti-viral medicine called oseltamivir (Tamiflu) which is used to prevent and treat influenza. Further advice on avian influenza in humans is available on the HPSC website. 11. Stay informed of the H5N8 and other AI viruses that might be present in waterfowl during the hunting season. 1. Report any unusual sick or dead birds to Regional Veterinary Office or avian influenza helpline (076 106 4403). 2. If it is necessary to handle dead wild birds, use disposable or rubber gloves and/or a plastic bag. Dispose of the gloves carefully or wash them in soap and water after use. 3. Dead birds being submitted for avian influenza testing must be double bagged and properly labelled with contact details. 1. Shooting and release of game birds may need to be restricted if they create a significant risk of disease spread through dispersal of birds, or presents a significant risk to human health. 2. European Legislation requires all shooting to be banned within 10km of a finding of a highly pathogenic avian influenza (H5N1 subtype) infected wild bird. 3. European Legislation requires the release of game birds to be banned within 10km of a finding of a highly pathogenic avian influenza in poultry. 1. Dogs are susceptible to canine influenza viruses but are not usually susceptible to avian influenza viruses. 2. There has been one report of a dog in Thailand becoming sick 5 days after eating a duck, and died the following day. 3. Experimentally it has been shown that dogs can be infected, but they did not show any signs of sickness. 4. Cats are known to be susceptible to avian influenza viruses. They need to be in contact with waterfowl, poultry, or uncooked poultry that are infected.